'The Walking Dead': Suicide King? Back from midseason hiatus, The Walking Dead just demonstrated not only what it can be as a show but what TV can be as a medium. From the beginning, playing character against context, TWD has made a theme of living death; now, playing story form against character and context, it's transcended itself dramatically. Rather than moving in any particular direction with any compelling purpose, this episode staggered monstrously, sort of in one direction, sort of in another. First the crowd in Woodbury roars like Roman Colosseum hooligans for Merle to kill his brother Daryl; next they're whining and trying to leave town because things aren't nice like they used to be. Rick's group meanwhile bump into each other with low-brain-stem character conflict ("Shut up!" "Shut up yourself!"). Glenn's still ANGRY. Back in Woodbury, the Governor drifts from vicious Thunderdomery ("The people have spoken. ... Fight! To the Death!") to mopey renouncement ("Those people have had it easy. Barbecues and picnics. That ends now."). And Andrea rallies the bewildered but easily rallied Woodburians with an "inspirational speech" that grafts zombie-apocalypse talking points onto a template created for inspirational speeches in 1980s after-school TV specials. Various characters from various subplots listlessly rehearse things that have already happened. Rick stiffly refuses to cooperate with the obviously good Tyreese. And maybe you thought we'd completed the dramatic arc of Rick's delusional psychosis from the telephone episodes earlier in the season? Nope, he lurches back into it, hallucinating that his wife's ghost is skulking in a vaguely symbolic white dress along the prison's catwalks. Staggering, drifting, lurching. Now the show itself is a zombie. It's sublime. Am I right, or what? ... 'Cause if I'm not, this episode was totally boring. You know, Gould, when you're right, you're right, and you're right. What a hot steaming mess of mind-numbing numbitude this episode was! No, check that, it wasn't boring -- it was offensive. We're supposed to believe that the charisma-free civil liberties lawyer Andrea would successfully rally the town with a single be-all-you-can-be endorsement of a one-eyed Jim Jones who is so blatantly off his rocker that even the morons who populate Woodbury might by now have noticed? Other problems ... Tyreese: Can we take his Jesus level down to 9, please? He makes St. Francis of Assisi look like a douchewaffle. I like Chad Coleman, the actor, quite a bit, but not even Cutty, the gallant and self-sacrificing character he played on The Wire, projected such transparent goodness. His perfection makes him uninteresting. Can we take Tyreese's Jesus level down to 9? And Rick, talking to ghosts again: It's completely plausible that a man who was shot, fell into a coma, woke up to a zombie apocalypse, found his wife, killed his best friend, almost lost his son, lost his wife, had a baby, and watched many of his friends get eaten, would face some challenges to his mental health. So why are we so impatient with these hallucinations? Is Andrew Lincoln overacting? I can't figure out why I'm getting so annoyed. The best part of this episode: Glenn's black-eye make-up. Someone should get an Emmy for that. Glenn, on the other hand? Eh. The writers gave him a tantrum, it seems, simply to allow him crush a skull filled with puttanesca sauce. Not interesting. And not frightening. That's the thing about "The Suicide King": I wasn't scared. The Walking Dead only has me when I'm scared. I don't want to judge based on this one episode, but I'm wondering if the writers are a bit lost. Maybe I'm just feeling generous, but "hot steaming mess of mind-numbing numbitude" seems a little harsh to me. I'd call it a lukewarm, half-baked, but ultimately palatable hour of television. I wouldn't say "The Suicide King" is The Walking Dead's finest hour, but I wonder if our expectations were all a little too high after a few months without our weekly zombie fix. After spending much of the second season frustrated by TWD's good-but-not-great-ness, I've come to accept the series for what it is: A solid (and extremely polished) zombie drama with occasional flashes of brilliance. The real problem with "The Suicide King" was anticlimax. After months of anticipation, how would the Dixon brothers manage to escape the Governor's makeshift gladiator arena at Woodbury? By deus ex Rickina, as our heroes show up in a hail of gunfire, saving the Dixon brothers from having to seriously harm each other -- and saving the writers from having to find a more interesting solution to their predicament. And how does The Walking Dead mark the Governor's descent from villainy to super-villainy? By having him perform a wordless execution and morosely mumble through the rest of the scene. Looking ahead to the remainder of the season, I'm most worried by the way these characters seem to be getting less complex as the series goes on. The Governor is a lot less interesting when David Morrissey can't turn to his natural genteel charm to balance out the character's menace. And Glenn has plenty of reasons to fall into the grimness that defines pretty much every other character on this series, but I'm sorry to see it happen all the same. Remember the first season, when he went whooping down an empty freeway in a Dodge Challenger? This is the most depressing TV show without "Kardashians" in its title, but there are opportunities for The Walking Dead to be more than unrelentingly bleak if the writers care to look for them. Rick's dictatorship has made it too easy for everyone else to push aside the hard moral choices that should be at the center of the show's drama. And then there's poor ol' Rick. I too am sorry to see his hallucinations returning -- if only because his ability to shake them off after his game of telephone earlier this season felt like actual growth for a character whose story often seems to have run its course. When you rattle off the highlight reel of Rick's enormously eventful post-apocalyptic life, it sounds to me like a full character arc and then some -- which is why I'd like to renew an appeal I made earlier this year: Let The Walking Dead pull a Game of Thrones and send Rick Grimes off to join Lori on the catwalks of that great big prison in the sky. Rick's ascension to semi-benevolent dictator was a terrific capper for the second season, but in practice it's become far too easy for the rest of the show's characters to push aside the hard moral choices that should be at the center of drama in The Walking Dead. In "The Suicide King," the naturally kindhearted Hershel has the luxury of telling Tyreese that Rick gets to decide whether or not Tyreese's group can stay, instead of carrying the moral burden of the decision himself. That keeps Hershel's character from evolving and keeps the show from moving forward -- and we all know what happens when The Walking Dead spends too much time in one place. So why not loose anarchy upon the Ricktatorship by killing off its eponymous leader? The series could blow up the expectations of viewers and comic fans alike and address the cause of its biggest narrative stopgaps by taking Rick out and scattering the rest of the survivors to the wind. Now that would be interesting. The Walking Dead: "A lukewarm, half-baked, but ultimately palatable hour of television." Goldberg wonders whether TWD's writers are lost. Meslow calls for them to kill Rick. ... I still don't quite know why this episode is called "The Suicide King." 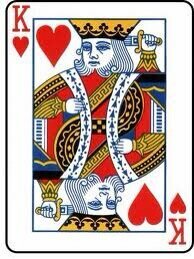 In the deck of cards, the King of Hearts is the "Suicide King," so nicknamed for appearing to put a sword through his head. With the Governor's new condition, thanks to Michonne, the clearer reference might have been to the King of Diamonds, one of the "one-eyed royals." But it all still is really about Rick, isn't it?